Bethany Homecrafts Upcycled Designs: 2 Weeks Already? We got away for a couple of days last week. My father-in-law treated us to a tour of his hometown, Biddeford, ME. He showed us the houses where he and Mom grew up, their school, church and many other places. We went to Old Orchard, and The Boy had a blast on the rides and in the arcades. We drove through Kennebunkport, which was so cute, and had lunch at Porpoise Point, looking out over to the Goat Island Light. Beautiful! I brought no work with me (unheard of), and only a light novel to finish. It was a wonderful break. It's been back to work since we got home. 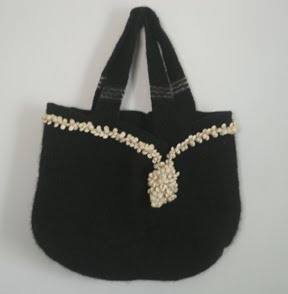 Here's a hip little black bag, trimmed with beads. 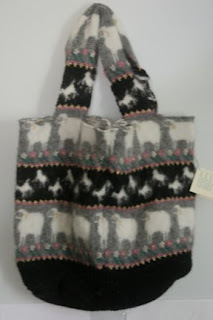 Very cute bags. Gladf to hear that you had a nice escape. We are on our way to Biddeford next week to check out a college. Must remember to take the camera! Drive through Biddeford Pool while you are there - very pretty. Have fun!